I will continue to post poets on The Far Field for the next week or two while Poet Laureate Elizabeth Austen plans her new website and prepares to launch. Keep reading! Elizabeth will give us some details soon about what to expect. And don’t worry, The Far Field isn’t going anywhere. This site will remain online as a resource and a record of poetry in Washington, 2012 – 2014. Jack Straw announces the 2014 Jack Straw Writers, who will work this year with curator Felicia Gonzalez: Laurel Albina, Claudia Castro Luna, Margot Kahn, Loreen Lilyn Lee, Susan Meyers, John Mullen, Michelle Peñaloza, Gigi Rosenberg, Raúl Sánchez, Anastacia Tolbert, Jane Wong, and Kristen Millares Young. Congratulations to all! Elizabeth Austen is our new Washington State Poet Laureate! The Official Word is out! 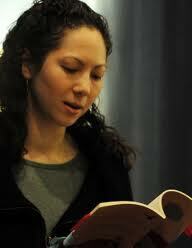 OLYMPIA —Elizabeth Austen has been appointed the 2014-16 Washington State Poet Laureate, effective Feb. 1. Austen, a Seattle resident, will be the state’s third poet laureate. Her appointment is sponsored by Humanities Washington and the Washington State Arts Commission (ArtsWA), with the support of Gov. Jay Inslee. As the poet laureate, Austen will build awareness and appreciation of poetry — including the state’s legacy of poetry — through public readings, workshops, lectures and presentations in communities, schools, colleges, universities and other public settings in geographically diverse areas of the state. Austen succeeds the 2012-2014 Washington State Poet Laureate, Kathleen Flenniken. “We are thrilled with Elizabeth’s appointment as our next Washington State Poet Laureate. She will be an outstanding ambassador for poetry in our state and inspires a deep appreciation for the art in Washingtonians of all ages,” said ArtsWA Executive Director Kris Tucker. In this role, Austen will serve a two-year term as the primary spokesperson, supporter and promoter of poetry in Washington. She will receive a stipend of $10,000 per year to help cover the cost of providing poetry programs and activities statewide. Austen is the author of a collection, Every Dress a Decision (Blue Begonia Press, 2011), and two chapbooks, The Girl Who Goes Alone (Floating Bridge Press, 2010) and Where Currents Meet (Toadlily Press, 2010). She produces literary programming for KUOW radio, a Seattle NPR affiliate, and is a communications specialist and educator at Seattle Children’s Hospital. Austen moved to Washington in 1989, at the time a stage actor, avid hiker and occasional writer of poetry. After a transformative trip to the Andes region in her early 30s, Austen focused her efforts on poetry. Her work trends towards the personal, touching on issues such as women’s societal roles, courage and searching for spirituality. When: Feb. 16, 2014 at 3 p.m. The Washington State Poet Laureate program is sponsored by Humanities Washington and ArtsWA and funded by the National Endowment for the Arts and the National Endowment for the Humanities. In April 2007, the Washington State Legislature passed a bill that established the Washington State Poet Laureate position and recognized the value of poetry to the culture and heritage of the state. Kathleen Flenniken served as the Washington State Poet Laureate for a two-year term beginning January 2012; Sam Green served as the first Washington State Poet Laureate from 2008-10. More about the activities of the Washington State Poet Laureate can be found on the Humanities Washington website. Established in 1961, ArtsWA collaborates with artists and arts organizations statewide to conserve, promote and develop artistic resources. For more about ArtsWA, visit arts.wa.gov. And a little personal word: I am delighted that Elizabeth Austen is taking over this role, which has been the most exciting and gratifying of my working life. She is so beautifully equipped to take the job in new directions to an ever-growing state-wide audience. Elizabeth is a wonderfully accomplished poet. For years she has demonstrated her gift for building an audience for poets and poetry. It’s only fitting that she should carry on her excellent work in this very visible and official capacity. Congratulations, Elizabeth! You’re going to be amazing. On a hot summer day many years ago, I’d been thinking about the enormous power of the metaphor mind, the mind that sees the world through the lens and network of analogy. The doors of my studio were open and bees sometimes swept in and began banging their heads against the skylight. The bamboo outside was rustling like taffeta skirts and it was an altogether lovely day to be thinking. I glanced, by chance, at my bookshelves and saw an eye loupe sitting there, next to the clay alligator. (An eye loupe — or jeweler’s loupe — is a magnification tool that looks like a tiny top hat. You hold it so the flared end cups one of your eyes, while an object of study is held about two inches away.) A friend, the architect Fred Bassetti, had given it to me. He’d shown me seedpods that he kept in a box. Strange and exotic seed pods from Africa and Latin America. He’d drawn lessons for architecture from those pods. I picked up the loupe and wondered. Everything has an unlocked secret. What was the secret of the loupe? I’d been a classroom teacher in San Diego, but in Seattle I’d thrown myself into “the writing life”. Both worlds ticked like dueling, sometimes rhyming, clocks inside me. What secret did the loupe hold that perhaps kids, or even adults, could use? I had nothing exotic to explore, so I looked at the closest thing: my hand. It was like another planet… dry as a desert, folded and rumpled like the earth seen from an airplane. It was like a quilt and reminded me of chicken tracks in the mud and of Buckminster Fuller’s geodesic dome and the lines made me think of expansion joints in the facades of buildings. I had really never seen my hand before! Since I was in the habit of writing poetry, a poem about my hand bubbled up. It was so easy and so much fun. But what was the question that drove the lines of my poem? Ah. “What else does it remind me of? What else does it look like? What else? What else? What else?” With the loupe and that first question, kids could generate all sorts of writing! Then I went outside. I slid down the throat of a foxglove, traipsed across a furry leaf, and took a walk on the back of a beetle. Poems came tumbling out, but also scientific questions and mathematical inquiries. I practiced drawing a flower through a loupe. That afternoon The Private Eye program was born. The Private Eye Project, originally grant-funded and piloted in the Seattle Public Schools, has grown into a national program. It brings out the poet, scientist, and artist in anyone. With the help of the loupe — which smashes stereotypes — and four simple questions, students and adults easily generate “the bones-for-poems”, the bones for stories, essays, reflections, then move into hypothesizing, theorizing, inventing, designing. For 25 years now, kids and adults have been using The Private Eye approach to write, draw and theorize across subjects. What’s the larger purpose? It’s to build the habits of mind of writer, artist and scientist — in one fluid motion. NOTE: Some elements of the above article are adapted from the introduction to The Private Eye — (5X) Looking / Thinking by Analogy: A Guide to Developing the Interdisciplinary Mind, by Kerry Ruef (The Private Eye Project, 1992, 1998, 2003). Kerry Ruef is founder and director of The Private Eye Project, a hands-on program to spark creativity and critical thinking that fuses poetry, science, and art, K-16 through life. The recipient of numerous grants and awards, in 1979, on a year-long writer-in-residency with the Seattle Arts Commission, Kerry created “The Floating Poetry Gallery”, one of the first efforts nationwide to bring poetry into public places. Artists created works based on juried poetry integrated into the art. The results rotated through Seattle public buildings. Kerry’s poems and essays have appeared in Harpur Palate, Prism Review, Whole Terrain, and other literary journals. She won the Prism Review Poetry prize and was a finalist for the Milton Kessler Memorial Poetry Prize (Harpur Palate), the New Letters’, and the Third Coast poetry prize. She lives in Lyle, Washington. My appointment as Washington State Poet Laureate will conclude in February 2014. They’ve been the most gratifying two years of my working life. My most wonderful sponsoring organizations, Humanities Washington and Arts WA, have just announced they are accepting applications for 2014 – 2016 Poet Laureate. Last year, early in second grade, Cynta-Liyah started stoppin’ by the library as others headed to the playground. She’d ask if this was a time she could stay inside to write a poem. 15 minutes later, as other kids were streaming in from recess, she’d quietly hand me a short piece she’d written. Just picked. Fresh. Ready to be added to our poetry anthology. She’d smile, then slip ’round the corner and back to class for the final hour of the day. Remarkable. And that was before she started bringing in the boys. Boys whose names were heard as teachers raised their voices “Cut-that out-and-stoppit-NOW” levels. Boys who tied teachers in knots of frustration and sent them over the line and down the hall to the principal’s office. Boys who would look up from the chair outside the principal’s office while classmates went out to lunch recess and their teachers headed to the lounge to flush their frustrations with “I can’t believe he did it again” conversations over lunch. That’s how our Poetry Club began. Cynta-Liyah taking boys under her wing. Working together on a little poem. Finding something good inside; going and growing from there. This year other second graders saw what was happening and asked to stay in, too. Our poetry club was formally announced. Girls writing friendship poems to one another. Others began writing love notes, birthday wishes, Valentines and “things I love” lists that capture perfectly their precious aspirations and emotions, preserved on paper against the amnesia of adolescence yet to come. April arrived bringing National Poetry Month and Elliott Bay Books offered an opportunity for our poetry club to recite a few “Poems to Learn By Heart” for Caroline Kennedy’s public appearance in Seattle. I spotted Janet Wong’s “Liberty” as a perfect group recitation, following the cadence and updating the sentiments of The Pledge of Allegience we recite at the start of each school day. So different that make us America. To think and to learn. For liberty and justice for all. Our poetry club kids took to it immediately, their faces and names reflecting beautifully the sentiments of the poem: Wang, Vu, Nguyen, Martinez. A week before the event, I was informed that Ms Kennedy would like to visit our school, to bring media attention to the role of school libraries and to meet our student poets. Ms. Tsuboi’s first grade class came into the library with their classroom poetry notebooks in hand, and read several poems. Then the poetry club kids came in, with “Liberty” followed by Quinton and Cynta-Liyah sparkling with irrepressible joy. Today New York TImes blogger Dana Jennings reviews four “micro presses” from Washington State: Sally and Sam Green’s Brooding Heron Press, Paul Hunter’s WoodWorks Press, the late C. Christopher Stern and Jules Remedios Faye’s Grey Spider Press, and Copper Canyon Press (wonderful, yes, but beyond micro!). Here is the link to a longer appreciation that includes excerpts from some lovely poems.